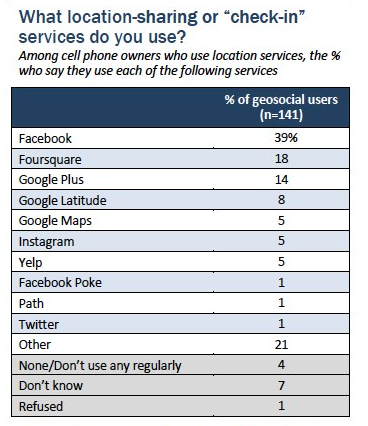 The Pew Research Center has been focusing on the use of location on mobile devices. They have come to a conclusion that almost three-quarters (74 percent) of smartphone users access directions and other location-related information on their devices. The survey has also found that checking in has declined in popularity since last year. Facebook is the most widely used “check-in” services as of today followed by Foursquare. 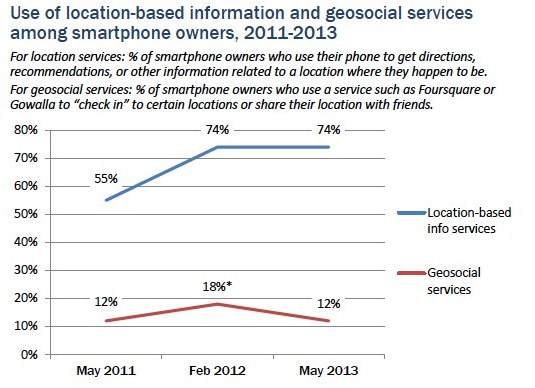 In the graphics above we have tried to compare the use of location-related services and check-ins. The use of the former has remained steady whereas the checking-in has dropped from 18 percent to 12 percent since 2012. However, no hypothesis has been offered for the decline rate. But it is opined that Foursquare’s move away from check-ins may have impacted user behavior. Facebook is leading in check-ins by 39 percent followed by Foursquare (18 percent) with Google+ surprisingly not very far behind (14 percent). Note that the sample here is extremely small (141 users) and the data may be unreliable. 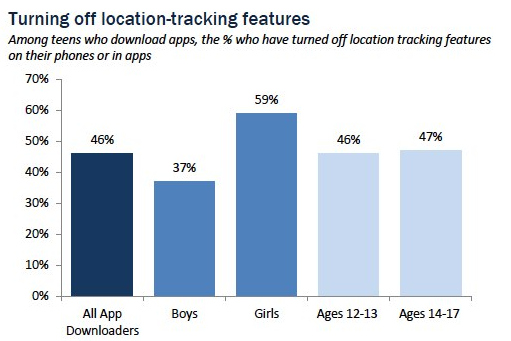 Pew also found last year that that 46 percent of teens have turned off location tracking features on their cell phone or in an app.